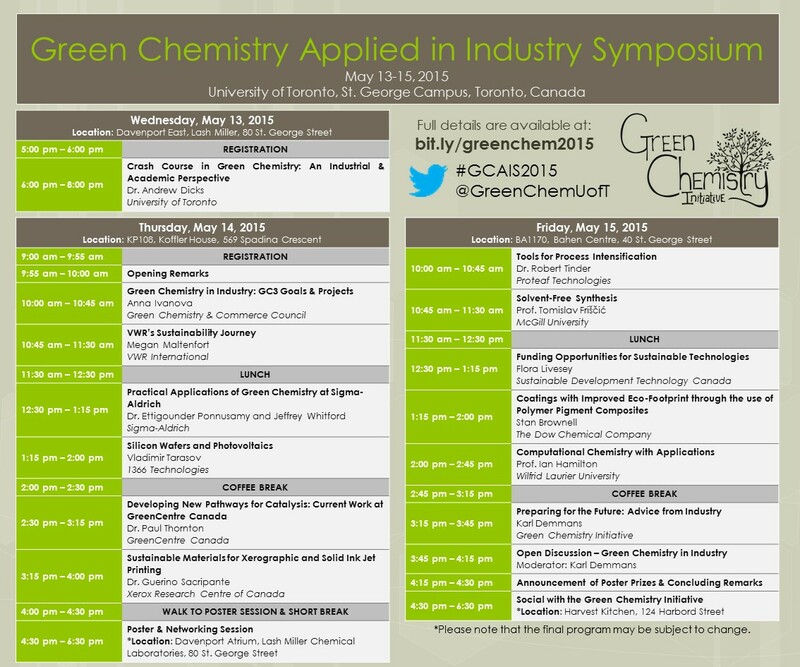 The third annual event, now a symposium, organized by the Green Chemistry Initiative aims to connect graduate students with industrial leaders to discuss future goals pertaining to sustainability and greener syntheses. This symposium was designed by graduate students for graduate students (though all are welcome to attend!) and highlights the methods various industries employ to make their chemistry efficient and more environmentally friendly. Come and join the discussion for two full days of lectures and discover the finer details of Green Chemistry which brought these innovations to the world through the decades of research. For a digital copy of the full program, please click here. Thank you for all the Poster submissions this year! You may find the abstract for each here. We are offering a total of four travel scholarships to contribute towards travel and accommodation expenses. The value of each scholarship is a maximum of $250 CAD. Applications are due Monday, April 20, 2015 at 11:59pm by email. For full details, please click here (PDF). External Registration: The cost of the symposium is $60 CAD for advanced registration (by April 17, 2015) and $100 for regular registration (by May 1, 2015). This cost includes all lectures, networking events, and catering for the duration of the symposium. Registration does not include accommodation and travel fees. Registration is now closed! You may still view the registration page here. Internal Registration: If you are a graduate student or post-doc in UofT's Department of Chemistry, please register in person with a GCI member. Registration will be available during our Friday trivia events in the atrium. Alternatively, feel free to approach any member of the GCI on your own time to register, or e-mail the symposium organizers directly at gcisymposium2015 [at] gmail.com to set up a registration time. The internal registration deadline is May 1, 2015 at 5pm. After registering, all participants must fill out a questionnaire to let us know what you'd prefer for lunch, and if you're presenting a poster. Please click here to access the questionnaire, and fill it out by May 6, 2015. - May 14 & 15, 2015 - Symposium! The nearest accommodations can be found at New College residences at the University of Toronto St. George campus. The symposium starts at 6pm on Wednesday, May 13 and ends at 5pm on Friday, May 15, though you are welcome to stay a few days over the weekend to explore the city of Toronto. Student rates at New College are $43/night for singles and $60/night for doubles for up to 5 nights. Remember to book well ahead of time to ensure your spot! For more information on how to get to the University of Toronto St. George campus, visit สล็อต999.